Brad is a paper boy who wants to be a rock star, so when he discovers the band Black Day playing in old Professor Hammer’s garage, he really wants to join. Brad sets out to change their minds, but the monsters have bigger problems than finding a bass player. Halloween will never be the same again. 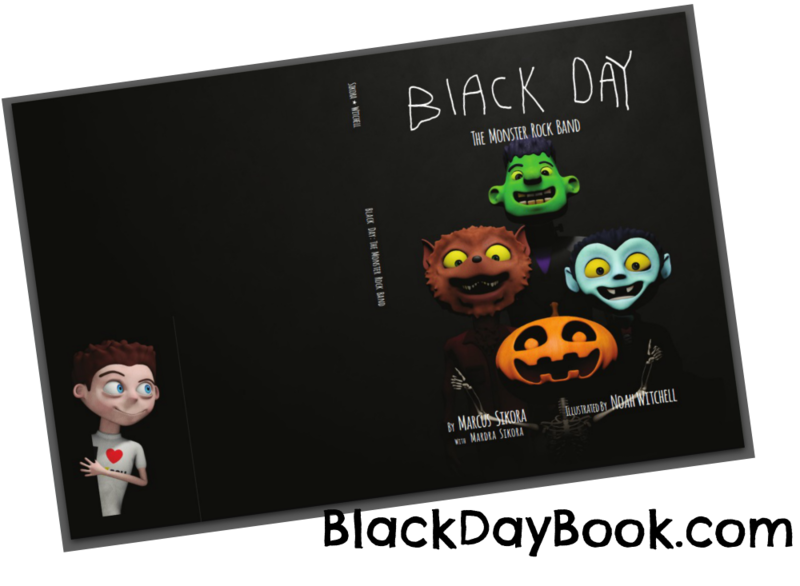 Black Day: The Monster Rock Band is a hardback, 40 page, fully illustrated, story book for children (of all ages, of course!). The reviews are rolling in. Start here! Check our events page for readings, and contact us if you want your town on the calendar. Want to know more about the authors? Click here: Marcus Sikora with Mardra Sikora. About the process of creating this book? Start here. 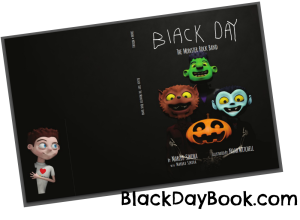 Want updates from Grown Ups and Downs, including news about the forthcoming animated, read along, short to be released before Halloween 2015? – Join the club here!